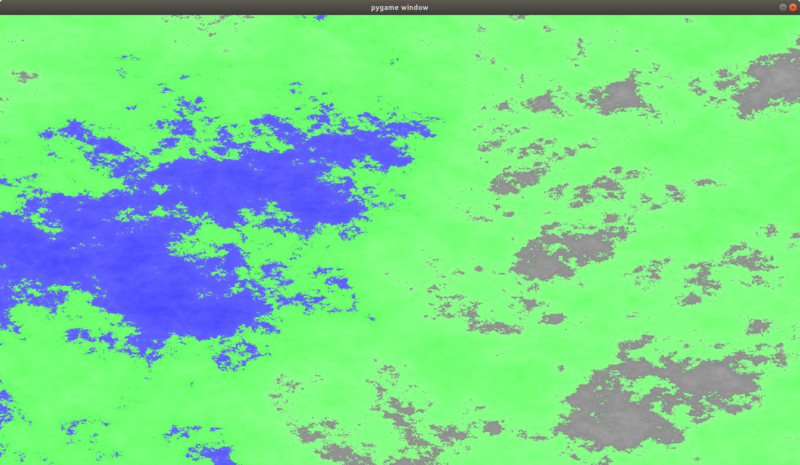 I am experimenting with Perlin Noise and random map generation. I have a 2D numpy ndarray full of 16-bit floats called map_list that I call from the singleton ST. It has 900 rows with 1600 elements each. I am iterating through it to display different colored pixels to represent terrain at different points in the map. Array values in different ranges produce pixels of different colors. The total possible range is [0, 1] because I am normalizing the values. Is there a way to display the aforementioned pixels faster than I am capable of now? This file holds functions that modify pyGame surfaces. :param surface: A pyGame surface. the rgb color values to display the tile as. :param noise_value: The noise value at a specific point in ST.map_list. :param shade: How dark or light the tile should be. Pygame has added some functions that support numpy arrays for exactly this reason. So you can fairly painlessly convert from an appropriately sized numpy array to a surface. You could even go back again, if you wanted. # NOTE: numpy automagically "vectorizes" things like this. # multiply above. The '&' operator is overloaded for boolean 'and'. # NOTE: pygame.surfarray was added mainly to talk to numpy, I believe. Not the answer you're looking for? Browse other questions tagged python performance python-2.x numpy pygame or ask your own question.